Brindled and speckled bicolours are not new, but are only recently being properly noticed in cats. This article covers road, tweed, karpati (salt-and-pepper) and other "roan-like" patterns. 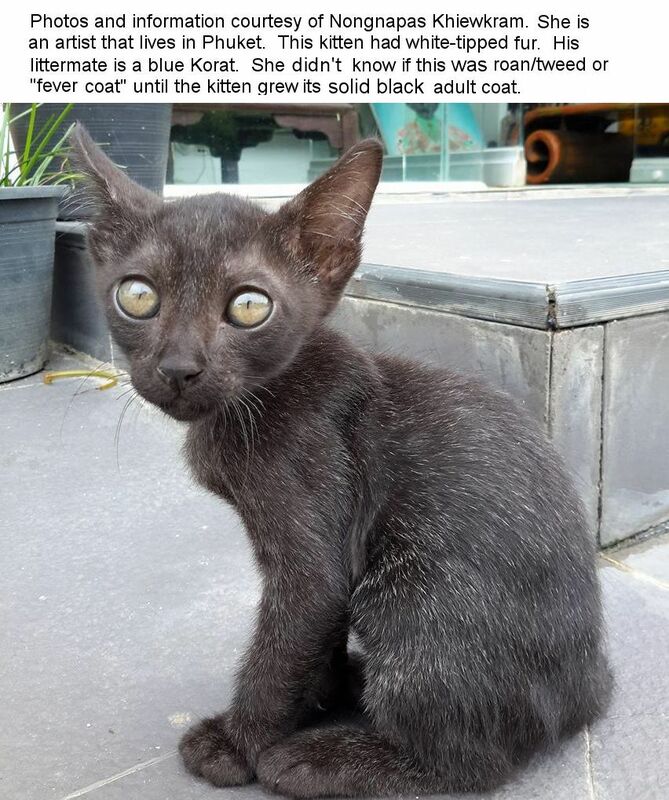 Because "tweed" and "roan" (evenly mixed colour and white hairs) is not currently an accepted term in the cat fancy, the Lykoi breed standard calls for the breed's distinctive colour to be "solid black" evenly mixed with amelanistic hair. The roan colour has a long history. Before they were known to Western cat fanciers, several Thai cat varieties were described and illustrated in the Smud Koi of Cats (circa 1868-1910). One of those breeds, the Saem-Saert, was described as blue roan (salt-and-pepper grizzle) and this colour sometimes crops up in random=bred cats in Thailand and neighbouring countries. In 2014 some curious black and white cats were reported from the Carpathian region: Hungary, Poland, Ukraine, Slovakia, Romania. These had silvery-white tails, toes/feet, ears and muzzle, but were otherwise black. Because these were mostly neutered pets seeking new homes, the cause of the odd pattern wasn’t known. The white areas appeared to be slightly grizzled with darker fur. Was this a new mutation? As it turned out, this is a very common pattern in the region, so much so that no-one even consider it was worthy of development or investigation. 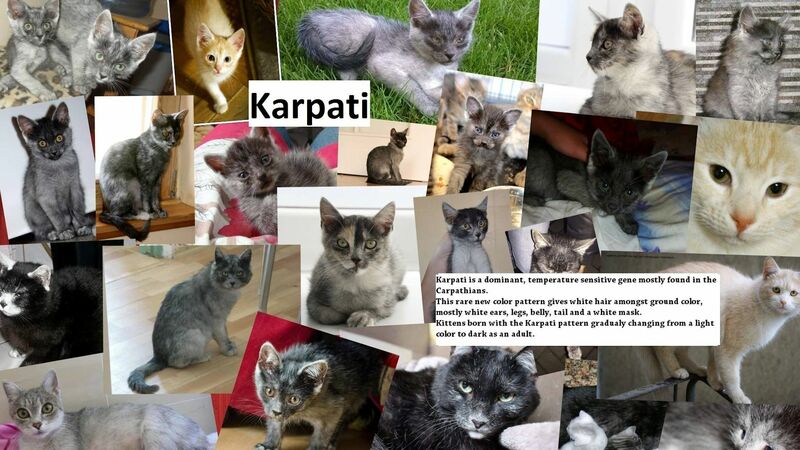 Gertrude Hainzl (Aquilaaltairral LaPerm) began breeding the Karpati trait (originally nicknamed saltnpepper) in domestic shorthairs and has provided photos of her cat Netti at 7 weeks old and 2 years old. Netti came from a private home in Budapest and her parentage is unknown. She darkened with age. Gertrude found that this is an dominant trait; the kittens are born lightcolored with lots of white hairs and few black ones, but darken over time. The degree of darkening is variable. The pattern appears to be temperature sensitive, starting white with perhaps a darker strip down the spine, and then pigmented hairs (in any colour) start coming in making it appear gradually more and more coloured on the body. There are still unpigmented hairs interspersed amongst the pigmented ones, in a sort of roan effect. The extremities have very few of these pigmented hairs so look almost white in some, but paler at least in all, so pale mask, tails, paws, ears. It is not related to colourpoint and, intriguingly, a cat can inherit both colourpoint and karpati to create very unusual patterns. Unlike the Thai Saem-Saert, the Eastern European cats have "powdery" points. Gertrude Hainzl and Anne-Louise Magee (Frisson LaPerm, Queensland, Australia) are developing this new colour in LaPerms. The only breed that allows "roan" is the Lykoi (a sparse-haired breed). Because roan was not (currently) a recognised colour with cat registries, the cats were registered as solid coloured with amelanistic hair evenly dispersed throughout the coat. The pedigree Lykoi is being developed by Britney Gobble and the only permissible colour is black roan - black fur evenly interspersed with white hairs. Similar cats occur from time to time and exhibit other roan colours e.g. red roan, blue roan where the white hairs are evenly interspersed with those colours. While the Lykoi breed must have the grizzled grey colour, cats of simlar type spontaneously appear in all colours. In Lykois, the sparse hair and the roan colour are inherited independently. 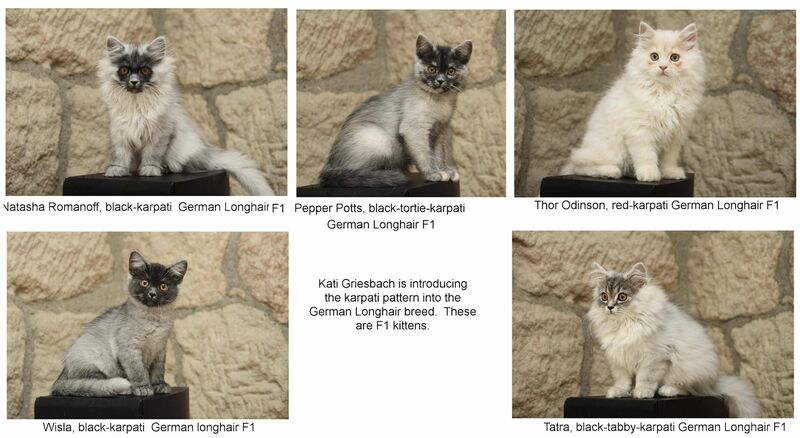 Below are some roan/tweed cats with straight fur. 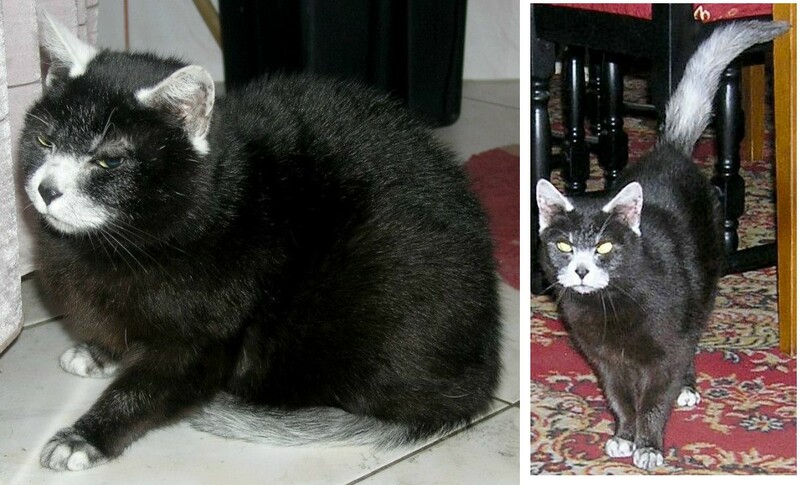 Two ferals from Chelmsford, England, in the early 1990s. The male is a ticked cream and the female has the salt-and-pepper effect. In 2008, examples of brindled black and white "tweed" were reported. One was a "tweed" kitten called "Ezekiel" from Utah, rescued from a reservation as a feral kitten and now being exhibited as a household pet. Another was a kitten shown in Detroit, handed into the shelter with its parents, both of whom were bicolours. Both were neutered so the mutation cannot be investigated. 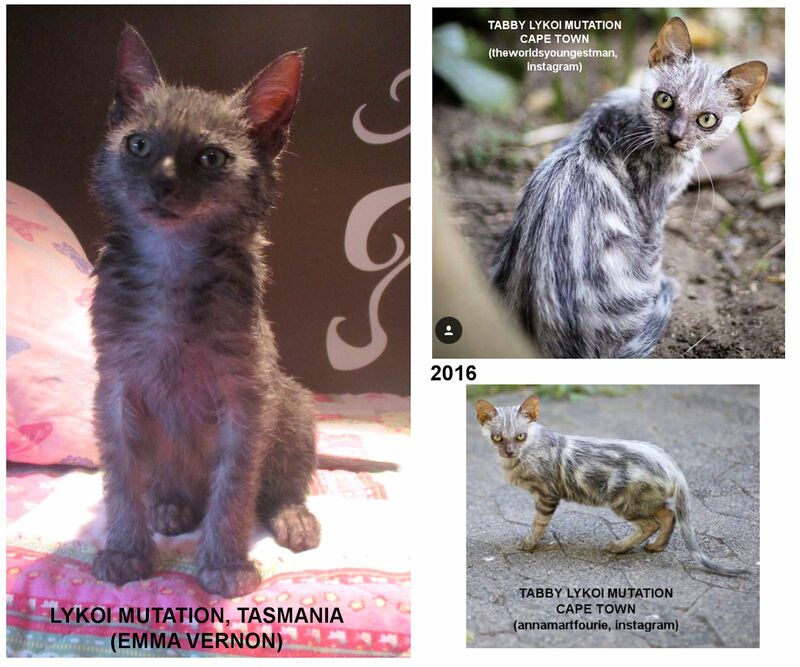 Compulsory spay/neuter (before adoption) in the USA is preventing these new mutations in random-bred cats from being investigated. Another tweed was a purebred Exotic, but the white brindling comes and goes. Another tweed that was temporary was a shelter kitten named "Versace" that arrived with dilute calico and tabby-tortie littermates. The unusual kitten had black roots to her fur and the remaining three-quarters of each hair was white and black ticked. Later on, the fur was moulted and the adult coat was tortoiseshell so the temporary tweed effect seems to be a phaeomelanin failure like Pandora and Kuuru. 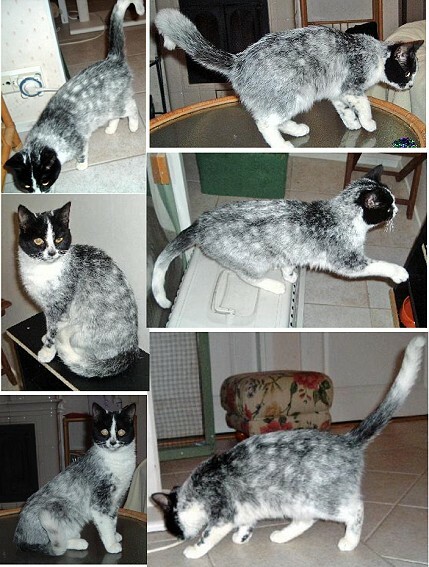 Pandora (owned by Bill B, Granby, MA, USA) is a brindled cat with what appears to be an unusual mutation. She has the brindled pattern normally seen on tortoiseshell cats, but the patches which should be red are white! The brindling and facial pattern is typical of tortoiseshell cats, but it seems that 15 year old Pandora has a mutation that prevents her producing red pigment. Is this roan/tweed, or is the gene that should produce red pigment faulty? Since Pandora was spayed before Bill obtained her, it isn't possible to breed her to see if it can be inherited. 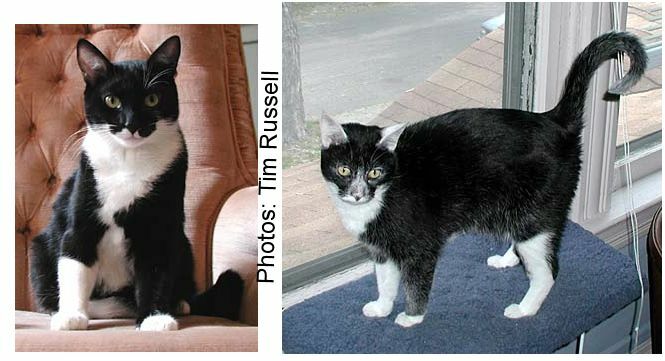 While checking my archives, I found this from Tim Russell in 2005: My cat, Galileo, is an otherwise healthy male with a classic tuxedo coat. He's a little small for a male and has always had a pink nose (with dark spots) and pink paw pads. His eyes are standard greenish yellow. At about 18 months the fur on his ears turned white. The sprinkle of white hairs on his nose grew until there was all white hair between his eyes and down his nose. His tail (previously all black) has turned to a salt-and pepper mix of black and white with the tip now being almost all white. And his black areas on his back and thighs are a salt and pepper mix. I wonder if he's going to turn all white! I have had him checked out by a vet and they said he seems in perfect health. I would agree: he's frisky, happy, and has a fine appetite. Neptune is owned by Karen Tanner and has turned from black specked with white to white speckled with grey! At the same time, he has some unique white markings on his face, and his nose has turned black at the same time as his fur lightened. 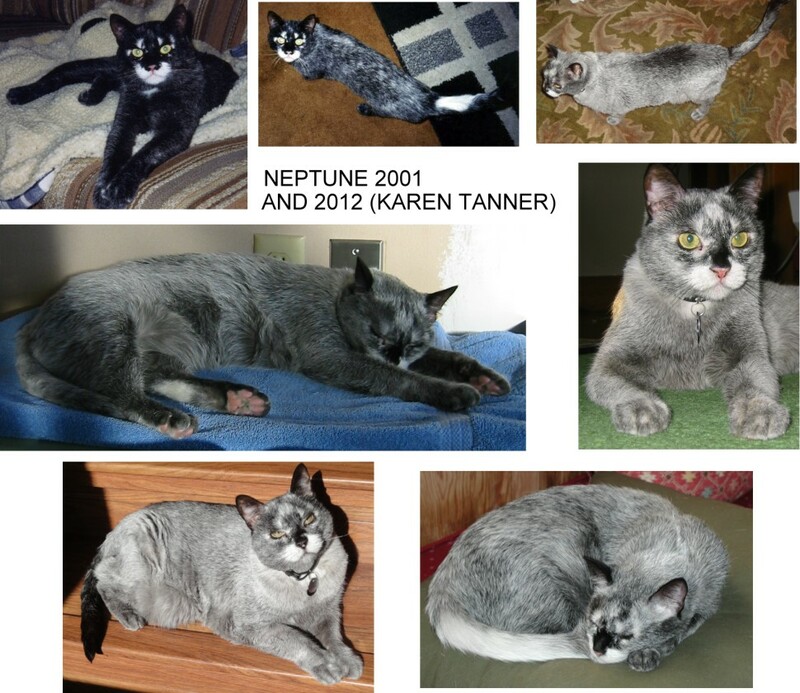 Karen acquired Neptune from a Humane Society in San Jose, California in 2001, when he was at least 1 year old and already neutered (so no possibility of seeing if his trait is hereditary). In earlier photos he is black with white speckles and a pink nose, plus an unusual white splotch on his tail (which is now more or less gone as his colour changed). His fur started getting gradually lighter and his nose darker. By 2004 he still had a pink nose and the white splotch on his tail, but by 2012 he looks a pale grey and his white splotches are harder to discern. This phenotype seems fairly uniform, but all of the reported cats have either been sterilised or were infertile due to inbreeding. It would be exciting to be able to breed and investigate this mutation. Most of the cats were found in Finland, withone turning up around 1000km away in a town in Russia. All were found as stray or feral cats. In general the torso has a mix of black and white fur giving a roan effect. The legs and tail are white with black dapples. The head is solid black with a white inverted V-blaze and a black nose. Some of the cats also have evenly spaced, well contrasting white spots on the torso. The shoulders and the front of the forelegs is darker than the torso. Maria Heinola from Finland brought this cat (Kuura, alias Tuisku) to my attention in 2009 and cat rescuer Saila Tiainen (who has allowed the use of the photos) has provided background information. Kuuru is shown at about one year old and has dark, copper coloured eyes. Like Pandora, she initially appeared to be tortie without red pigment. However, with males also being born with the markings, it appears to be a whole new colour/pattern mutation. Saila explained that Kuuru is a domestic shorthair born in the small countryside province of Petäjävesi in Central Finland. She was born in a a household colony that had been inbreeding for up to a decade. There was no control over the cats' reproduction except for excess kittens being destroyed. No-one is sure when the white-tabby pattern first appeared. 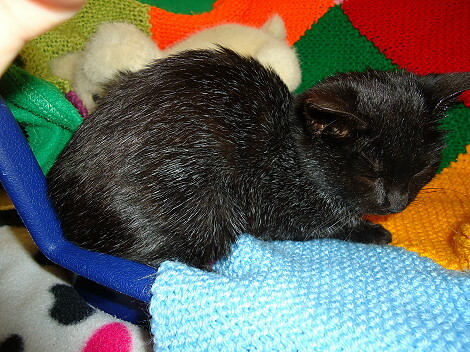 In August 2007, a rescue society removed several kittens and all the pregnant females. In December 2008, at the owner's request, they took the remaining 7-8 cats, half of which were put down due to FIP and severe behaviour problems (probably feral). 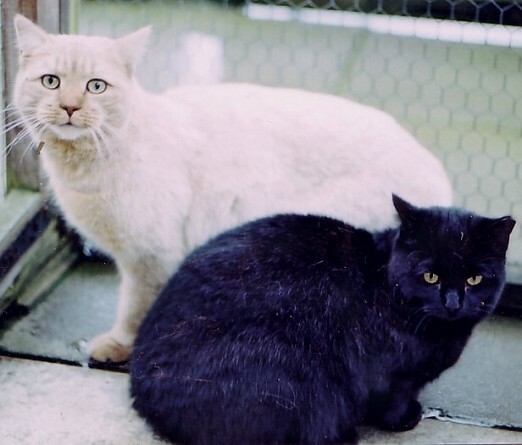 There were mainly two types of colouring: at least 5 individuals had the white-tabby pattern, including males and females; there were also black cats and black-white bicolours. The cats' owner said that 3 females with the white-tabby pattern were infertile. One of those white-tabbies was Kuuru (female, now neutered) who also has an abnormal tail tip. There was a young male with the same colouring and an adult female with behavioural problems (probably feral) that was likely to be put down. It is not known how many generations had the white-tabby pattern, whether any were fertile or which of the black/black-white bicolours carried the pattern. The fact there are males with the colour means it is not, as initially thought, tortie without red pigment, but a new colour/pattern mutation. 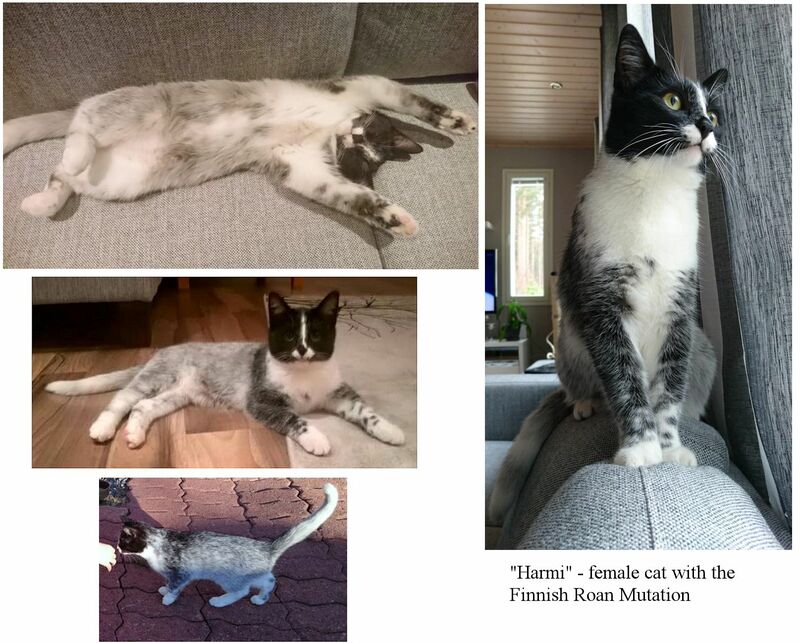 Another such cat was born in 2015 and was posted on Facebook by Janette Kivari and passed on (with permission) by Iina Nokelainen. The cat is named Harmi and belongs to Janette's boss. Harmi was born around 10km from Kuura's place of origin, Hattulantie, Keuruu. She came from a litter of several kittens. All her siblings were mackerel tabbies or bicolors. Her mother was a mackerel tabby, but the father's colour is unknown. She was born with this colouration, except that the grey areas of her fur were paler, becoming darker as she got older. Harmi has yellow-ish eyes. It isn't known whether Harmi came from an uncontrolled population, but she is most likely related to Kuura. 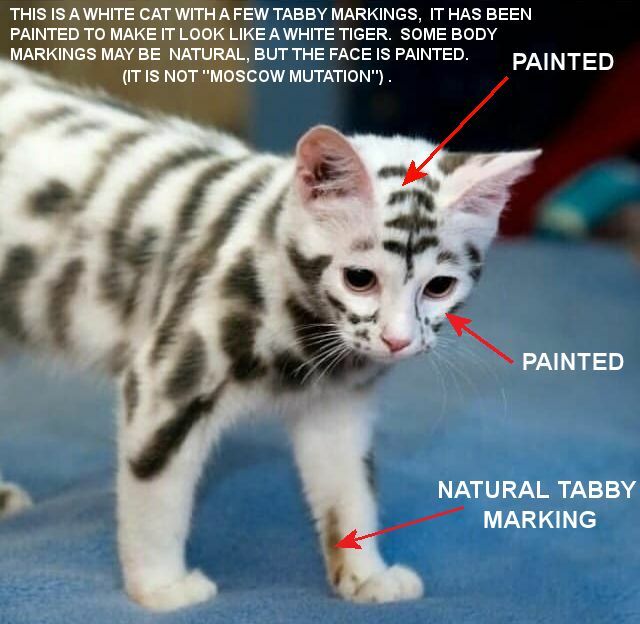 The next Finnish mutation cat was reported around 1000km away in Nizhny Novgorod, Russia to unknown parents and was reported in November 2017 by Natalia Border-Rottys who took some photos of the cat at a show. He was shown as a neutered household pet. Once again the legs and tail are pale and dappled, the torso is black roan and the head is black with a white blaze and black nose. This odd tabby pattern was seen in a semi-feral cat living in Moscow. It appears that the normal banding of the hairs has failed, leaving the tabby markings grey or roan, and leaving the background almost white. Enough photos exist of the cat to rule out digital editing and it does not appear to have been dyed (this cannot be completely ruled out). There are no close-up images of the cat. 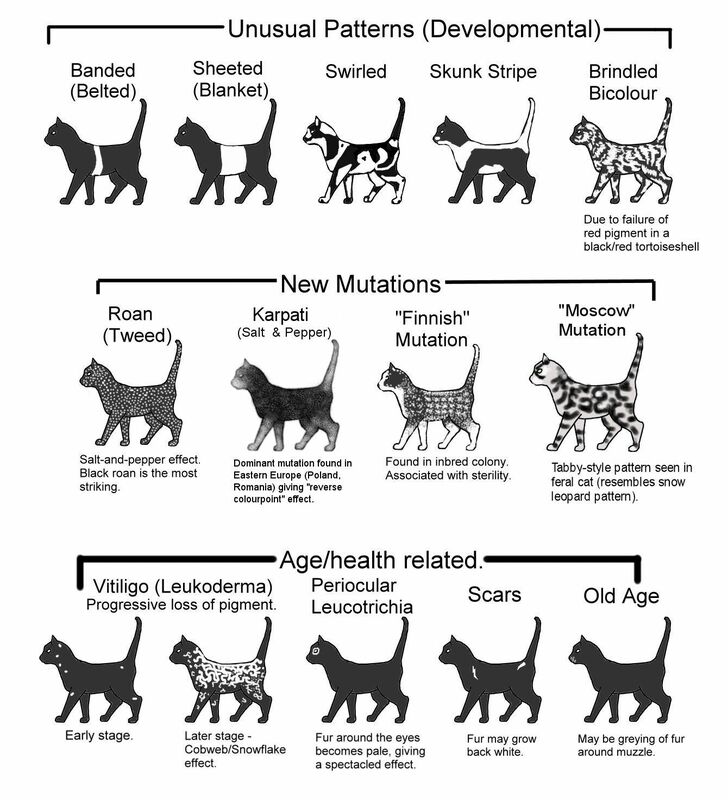 The tabby pattern itself is unusual and may be due to skin cell mutations or to chimerism. A number of copycat versions exist where white cats have been painted to resemble white tigers. The cat below is mostly white with some small amounts of brown tabby. The tiger-like markings have beed added using dye. The chart below shows a number of unusual bicolours, including roan/tweed, brindled bicolour and the "Finnish mutation".